RETIREMENT is looking rosy for Mr Koh Chek Koh, thanks to a combination of good luck and planning. The 62-year-old met the target Central Provident Fund (CPF) Minimum Sum when he turned 55 in 2007. Back then, it was $99,600 - an amount he hit easily without needing to pledge his property, unlike some. Mr Koh says: "I was lucky. My house was cheap and my pay was good. But not all senior citizens can say that. A lot of them don't even think about their CPF because they know there's almost nothing inside." 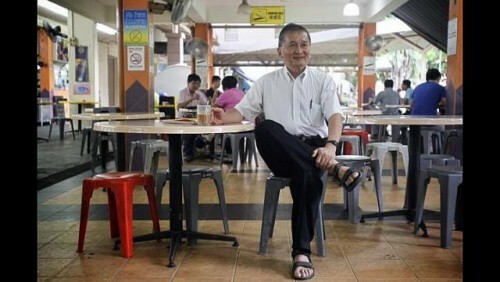 He lives with his wife, 56, and two sons, who are in their 20s, in a five-room flat in Hougang, snapped up more than 30 years ago at just $88,000 using his CPF and which is now fully paid off. The civil service veteran, who has been in the field for the last three decades, has seen his pay rise from less than $1,000 a month when he started out to $6,000 at its peak. He is still working in the sector even now, earning about $4,000 a month. He and his wife, neither of whom have chronic illnesses, make enough to cover their daily expenses. After Mr Koh retires, he is keen on finding part-time work to keep himself occupied. And in two years, he will also receive a steady stream of income in the form of monthly CPF Life payouts of some $800 for the rest of his life. "The ultimate purpose of CPF is to protect senior citizens. And the good thing is, CPF Life really is for life," he says. But sprightly Mr Koh, who says he is careful to always plan ahead, has some investments to help him retire in style. "For me, it was a good thing I couldn't touch the money in my CPF till I reached a certain age," he says. "Sometimes, if you have money in hand, you feel like spending. It's just human tendency." When Mr Koh turned 55, he withdrew all the money in his CPF account, leaving behind just the Minimum Sum. He spent $120,000 of this money on his older son's university education in Australia. The rest, which amounted to over $250,000, was used to buy endowment plans and insurance policies to grow his money. This has reached about $400,000 now, says Mr Koh - an amount he is in no rush to tap yet. While CPF Life payouts will come in handy for his daily expenses, these investments act as funds for both enjoyment and emergency. He will dip into them if he has a health problem, or if he and his wife plan to travel or buy new furniture in their old age. "You have to enjoy your life after retirement. You work hard before that so you don't suffer," he says. He adds: "CPF was a good thing for me but I know that for people who don't earn so much in their young years, knowing they have some money there but cannot touch is very tough on them."